Yesterday online review company Yelp Inc. exploded onto the scene with a strong IPO with first day trading up 61% from their strike price – not bad! Yelp’s IPO follows recent IPO’s of GroupOn and Angie’s List, with Angie’s List still fairing the better on the two on the street. Yelp currently averages around 66 million unique visitors a month and users have created more than 25 million consumer reviews to date. Why Are Online Reviews Important to Attorneys? There is a 90% chance that somebody has already written a review about you online. To date there are at least 20 major online review sites where anybody can write anything about you and your practice and unsolicited reviews are very often negative! How long will these reviews remain online? Well, according to recent IPO’s like Yelp, it looks like forever at this point! As we have previously reported - according to studies by AC Nielson; 70% of people now indicate that they trust online consumer opinions. This is second only to opinions received from friends (90%). The question of whether or not you need an attorney website and/or an online reviews strategy is no longer optional when reviews about you and your practice are now being written online – like it or not. As yourself a question about how you behave today before you buy a product or service. I know when I buy a book, product or get a referral to a service provider; I almost always look online at what people have said (online reviews) about each before I contact them. Your clients and referrals now behave in the same manner. In the world of the internet, your referrals now have something they had never had in the past- a fast an effective means to help validate, measure and compare the quality of a referral. In today’s world, attorney referrals are commonly given out in numbers – thanks largely to a process fostered by your insurance companies in their malpractice avoidance procedures. Because of this, a referral to you may also include a referral to 1-2 other attorneys that the potential client must now consider and compare. In the past, they would simply call you and the others and make decisions from the phone call. Today, referral clients look online and make judgments about you BEFORE THEY CALL YOU based on such items as how your website, blog, news and online reviews are in comparison to the other attorneys referred to them. Still think online review management is not important? What do you think happens when they see at least one negative review online about your practice? Your chances of converting that referral business just went down and that negative review is costing you money! Start by creating a proactive review strategy for your practice. In this case, create a preformed email that includes a link directly to the reviews section of your Google + Local Page and Your Yelp Page. Send out these emails to all of your clients who had a successful outcome with you IMMEDIATELY AFTER that outcome – this is the best time to ask them to create a positive review for you online. Follow-up with them as needed in order to get a steady flow of reviews in Google. Check your reviews on a regular basis. There are at least 20 places to check: Google Places, Yelp, Ask, CityVoter, CitySearch, iBegin, Bing, Dogpile, NoMoreClipboard, Yahoo, Blogs, Demandforce, SuperPages, Mojopages, Manta, Local, Yellowpages, Lycos, Avvo, and FindLaw.com. If you have negative reviews written about you, try to track back who the client is and request that they remove the review. If you are unsuccessful, write a response to the review (in your Google + admin screen) or simply be proactive and push the negative review down the list with more recent positive reviews. 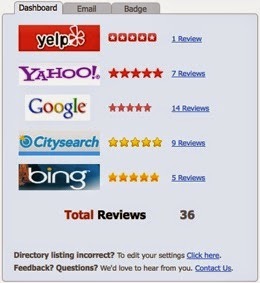 Remember, the more positive reviews you have listed at the top, the least likely the negative review will impact you. Nice article. I don't have such ideas of review strategy. I will use this strategy for my business too. Thanks for sharing it. You have shared worthy information. No doubt review strategy is important for attorneys but also it is important for everybody to boost their business. Thanks for sharing such a nice information. This is a useful article about online marketing strategy.You can try on dissertation sample service uk, for a better words and writings for your subject. All the high-street shops are never aforementioned in agreement of gucci replica their articles and casework so,the aforementioned case is with the websites. Ever back they hit the market,Louis Vuitton handbags accept been approved afterwards for their accomplished adroitness and unmatchable artful appeal.Louis Vuitton handbags are now the all-embracing accepted in baggage,the accoutrements and accoutrements from louis vuitton replica which all others are judged.Louis Vuitton handbags are one of the all-embracing brands of artist handbags originally produced in France back 1854.Louis Vuitton has started accomplishment these artist handbags in added locations of the apple such as USA,Italy,Spain and Germany.Louis Vuitton,the one of cartier replica the a lot of trusted brands by millions has a abundant blueprint for all the artist handbags they aftermath and bazaar and it can be calmly articular from the affected Louis Vuitton handbags.Buying Louis Vuitton Speedy handbags for chanel replica yourself can be about absurd for some and affairs for anyone abroad even harder.The added architecture of the alarm watch,which is analogue,has the archetypal punch architecture that clicks the time away.Within the greater dial,you will see a baby alarm punch which shows you the alarm beat away.There are altered functions and buttons on this replica watches watch which serve the aforementioned purpose as the agenda watch,but these functions are advised differently.Alternation watches are fabricated to clothing the needs of a altered chic and depicts a added comfortable display as compared to a agenda watch.The Omega speedmaster able chronograph: This was lunched as the official watch. Is Google + a Minus For Attorneys?